Also Available with pocket doors, TV Swivel and VCR hanger, need to be ordered by phone. Door Opening - 31" x 30"
Please call for alternate hardware options on this sliding door wardrobe armoire. See drop down boxes (shown top right) to select your wood armoire closet preferences. 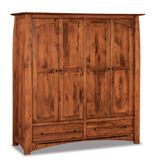 The pictured solid wood armoire wardrobe is made from rustic hickory with a Golden Harvest stain. Door Opening - 30½" x 28"
Door Opening - 30½" x 42¼"
Door Opening - 30½" x 33½"
Door Opening - 32½" x 42½"
Door Opening - 32½" x 27¼"
Door Opening - 26½" x 30¼"
The Bungalow 2 Door 2 Drawer Armoire is built piece by piece using old time construction methods. The front and sides are directly mortised into the corner posts for added strength. Mortise and tenon joinery along with solid wood bottoms and backs make timeless heirlooms for generations. Eight to ten weeks is required for the craftsmen to make all this possible. This armoire is a tall and elegant storage option. Each piece in this design family has cutouts by the corner posts. The door compartment has 2 adjustable shelves and clothes rod and three full-extension devetailed self-close drawers. 1 inches thick solid wood top and black wood knobs. The top shelves can be used as a TV armoire if your set is the right size.